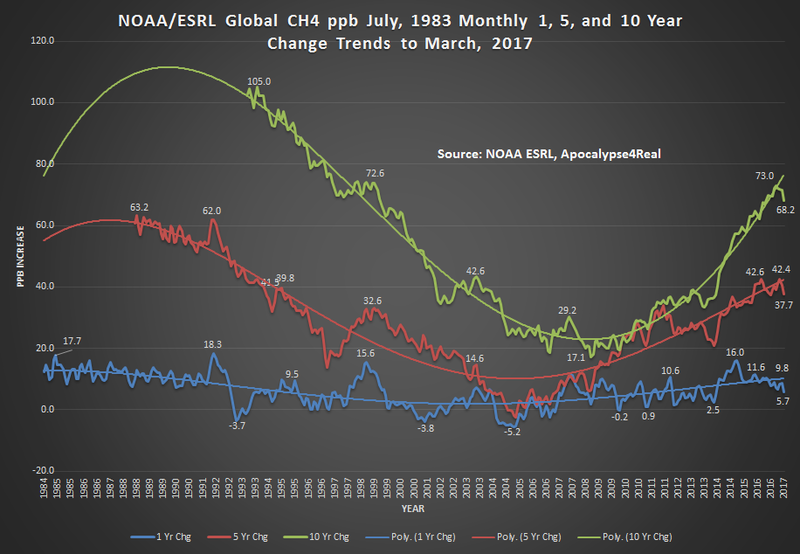 The March, 2017 global CH4 monthly mean data was released by NOAA ESRL on June 5th. The mean was 1847.8 ppb, up 5.7 ppb above March, 2016. The trend of increasing CH4 since early 2007 remains intact, although this has slowed somewhat since the recent high increases of 2014-2016. When one looks for milestones in the increases, assuming each 25 ppb increase as a milestone, the trend has been highly variable. 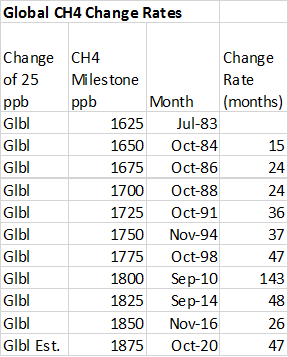 While earlier milestone increases were achieved quickly, there was a long slow down from 1998 to 2007, which delayed reaching 1800 ppb until September, 2010. We have seen another acceleration between 1825-1850 ppb, that may interrelate with recent ocean warming, rice or cattle production. There is still considerable science discussion on causes for the increase since 2007, and perhaps the recent slow down in those increases. The one, five and ten year trends depict the decline from the recent record increases in 2016. The one year monthly mean change was 5.7 ppb over March, 2016. The five year increase was 37.7 ppb over March, 2012. 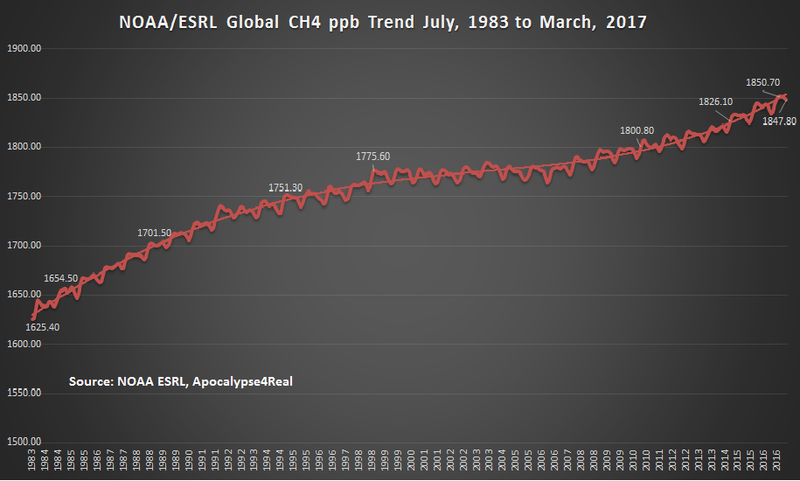 The decadal change was 68.2 ppb above March, 2007. 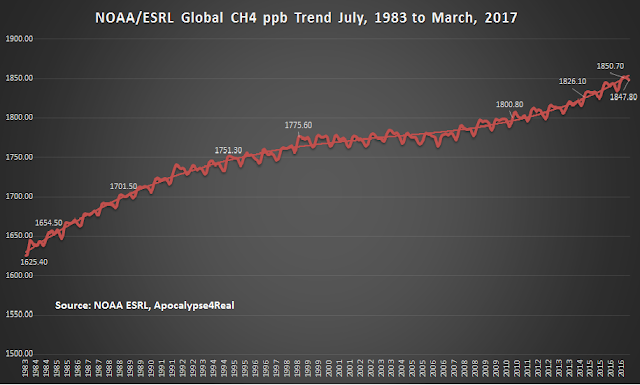 Since March 1984, global monthly mean methane has increased by 12.71% or 208.30 ppb. 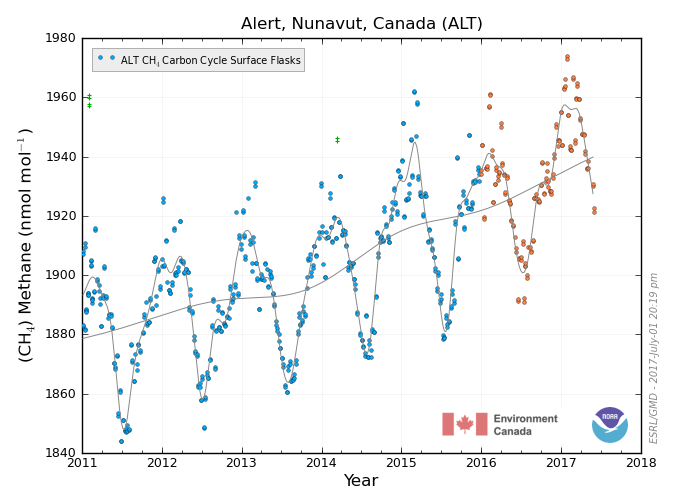 While the global monthly mean seems to slow down this month, stations around the Arctic seem to indicate that the acceleration in increases experienced since 2014 continue. 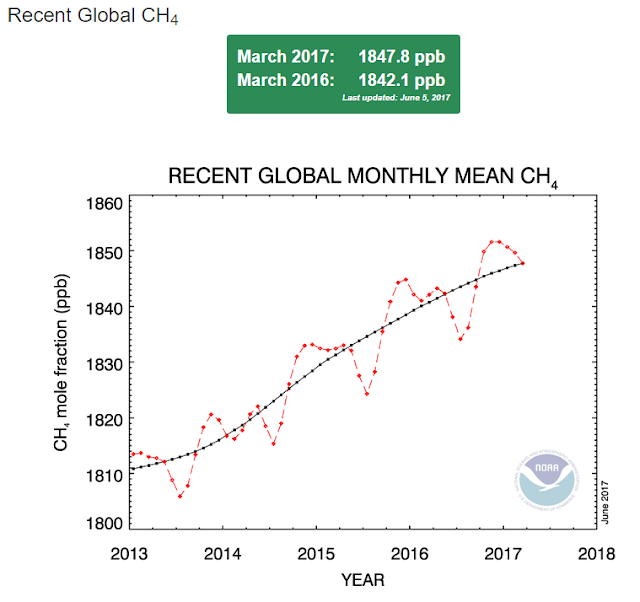 Once the 2016 data is verified, then a monthly comparison can be made to see how different the trends might be for each compared to a global monthly mean. For now, a few graphs demonstrate this preliminary finding. 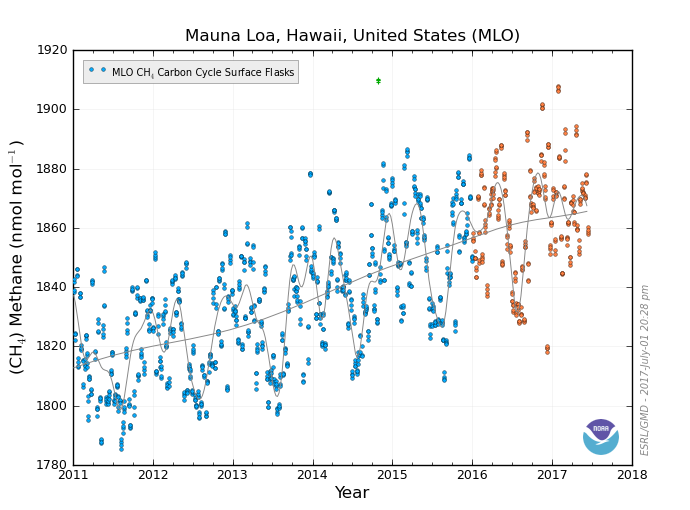 Here Mauna Loa CH4 is substituted as representative of the global trend. The change in the trend in late 2016 into 2017 mimics the global change. However, this is not what is revealed in the Arctic data. 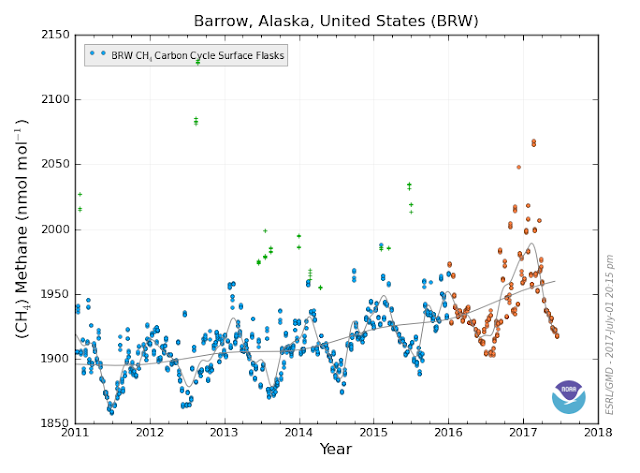 The Barrow CH4 portrays an acceleration of the increase through fall, 2016 and spring, 2017. Similarly, the Alert CH$ readings depict a similar concentration increase. 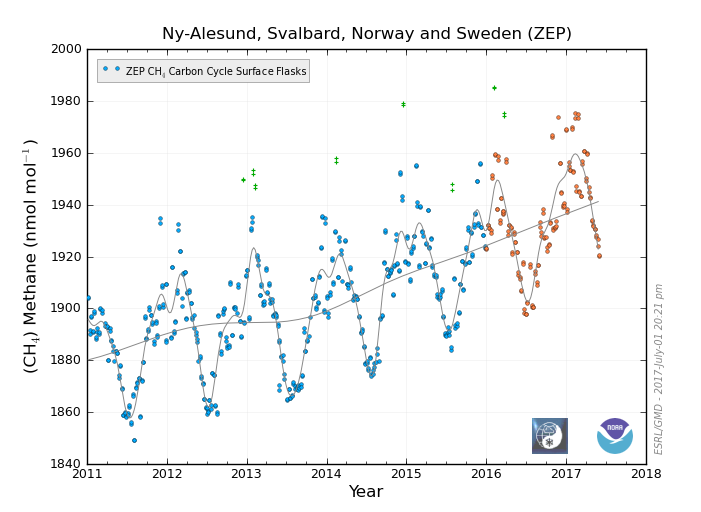 The Ny Alesund trend remains generally constant from 2014 through 2017 to date. Finally, Tiksi also reflects the same accelerating trend from fall, 2016 to spring, 2017. 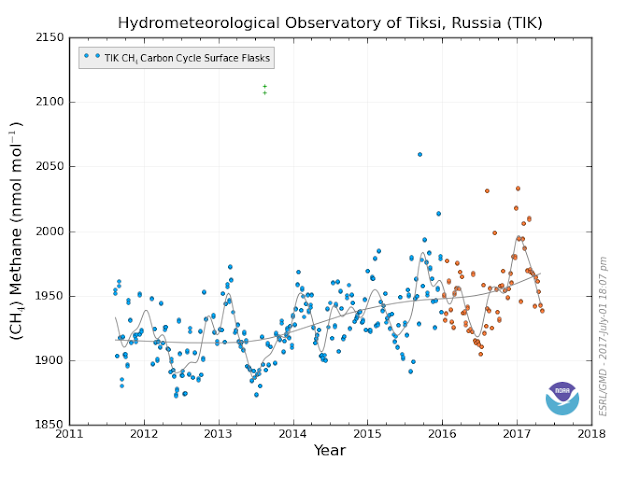 Given that all the high north latitude stations surrounding the Arctic reflect the same trend change, it seems reasonable to conclude that something is happening to increase CH4 release either in the Arctic Ocean waters, its sea ice cover, or in the permafrost regions in both Russia and North America. Either option presents the possibility of a climate feedback that would be worrisome for the future, if it continues.